The official Valve portrait comes out on December 17th, just in time for the gamer on your Christmas list. There's a lot of videogame merchandise out there, including toys, books, comics and costumes. Most of it isn't worth making too big of a fuss about, but it's hard not to get a little bit excited about the latest to come out of ThinkGeek. 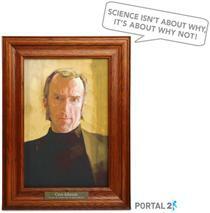 That's because it's a framed portrait of Cave Johnson from 'Portal 2.' He's the founder of Aperture Science and a character that affects the gameplay even having been dead for years. He's also the most memorable part of the game thanks to an incredible performance by J.K. Simmons. The portrait from ThinkGeek is officially licensed and includes 13 different sayings including, of course, the entire "when life gives you lemons" rant. It'll be available around the 17th of December at a price of $39.99.